Parkland shooting survivor David Hogg organised a boycott campaign against companies that run ads on Laura Ingraham’s Fox News show. Ingraham posted a tweet on Wednesday mocking Hogg for “whining” about not being accepted into colleges he applied to. Pet-food brand Nutrish became the first company to publicly discuss plans to pull its ads from Ingraham’s program on Thursday morning. A pet-food company is pulling its ads from Laura Ingraham’s show after a Parkland shooting survivor called for a boycott against brands that advertise on the host’s Fox News program. On Wednesday morning, Ingraham tweeted a link to an article about David Hogg being rejected from four colleges. In the tweet, Ingraham says that Hogg “whines” about being rejected. Hogg responded to Ingraham’s tweet later on Wednesday. On Thursday morning, Nutrish tweeted that the pet-food company is removing ads from Laura Ingraham’s program. “We are in the process of removing our ads from Laura Ingraham’s program, as the comments she has made are not consistent with how we feel people should be treated,” a spokesperson from Nutrish told Business Insider in an email. Nutrish is the first – and so far, only – company to respond to Hogg’s call to boycott companies that advertise on Ingraham’s show. Hogg has emerged as one of the leaders in the effort to promote gun-regulation legislation following the February 14 shooting at Marjory Stoneman Douglas High School that left 17 people dead. 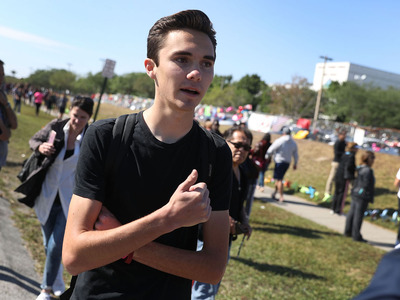 Hogg and other survivors of the shooting at the Parkland, Florida high school organised a boycott campaign in February against companies that offer discounts to National Rifle Association members. NRA members are offered discounts and other deals as part of their belonging to the gun-rights organisation. More than a dozen companies, including Delta, United Airlines, Hertz, and MetLife, cut ties with the NRA following the gun-control advocates’ boycott efforts.